30.01.2013 (HTN - Hvino Tour News) Tourism companies note lack of activity of Georgia's tourism authorities. GeoHotel, a company that runs a 3 – star hotel chain across the country stated to radio Commersant that GeoHotel has had almost no visitors since January 8. Shalva Alaverdashvili notes that there is a lack of visitors in Gudauri, because unlike last year, there is no support from the state. He explains that Mestia as a winter tourism destination no longer exists and they are going to stop a hotel functioning in Mestia. Alaverdashvili says that tourism development will be stopped without state support and advertisement of various resorts which signs have already existed. According to him, they applied to Ministry of Economy in order to develop hotels and projects in regions, however, received a reply from the Deputy Minister that the companies working in regions lacked the education and experience. 29.01.2013 (HTN - Hvino Tour News) According to the Tbilisi office of the company, the last flight on the route Tbilisi-London will be operated on March 29, and starting March 31, the airline officially ceases operations in Georgia. The decision to leave Georgia was made by the British Airways for commercial reasons. The airline states that Tbilisi-London and London-Tbilisi flights are unprofitable. British Airways returned to Georgia after a hiatus in 2012. 29.01.2013. Work on the project has been suspended. As Ozurgeti Economy, Infrastructure and Investment Environment Department Chief Merab Tsivtsivadze explains, last August Turkish and Arab specialists arrived in Georgia and conducted survey works, but since then not a single investor or any other person interested in Gurian airport has visited the village of Meria. "Working on the project was started, but this time the work is officially suspended,”- Tsivtsivadze notes. President Mikheil Saakashvili said about the need to build the airport in the village of Meria. " In September a large international airport will be opened in Kutaisi. We must begin to build an airport in Guria, in particular, in the village of Meria. Georgia, in terms of airports, will be one of the most developed countries in the world ", - he said. 28.01.2013 (HTN - Hvino Tour News) According to Georgian radio Commersant one and a half million investment project in Borjomi has been stopped. Tourism information center in Borjomi explained that the construction of the "Rooms Borjomi" hotel located in Borjomi Park has been stopped. Financial problems are named the main reason. According to the information center, the deadline of the project completion expires in May. Five more hotels are being built in the town of Borjomi, making a total value of 20 million 350 thousand GEL. Investment projects should be completed in May of the current year. 27.01.2013. The last time I travelled with my sister Zoe was a trip to Turkey 17 years ago. She beat all the men off the backgammon table, I tried to hire a moped without a licence and nearly crashed it, and my mother got so badly sunburned she had to stay in her hotel room. This trip was infinitely more sophisticated – not, as you might think, because we are old bags, but because Tbilisi is heaven on Earth. Not just because you can still smoke, or because the food you eat in every restaurant is fresh, seasonal and unlike anything you've ever eaten, or because you can drink usakhelauri, a wonderful light semi-sweet red wine (I am cradling a bottle to open on my sister's birthday). But also because, despite relentless onslaughts over centuries from unfriendly neighbours, the Georgian culture and spirit remain undimmed. 27.01.2013. Georgia, one of the oldest producing wine regions in the world, is rich in tradition. 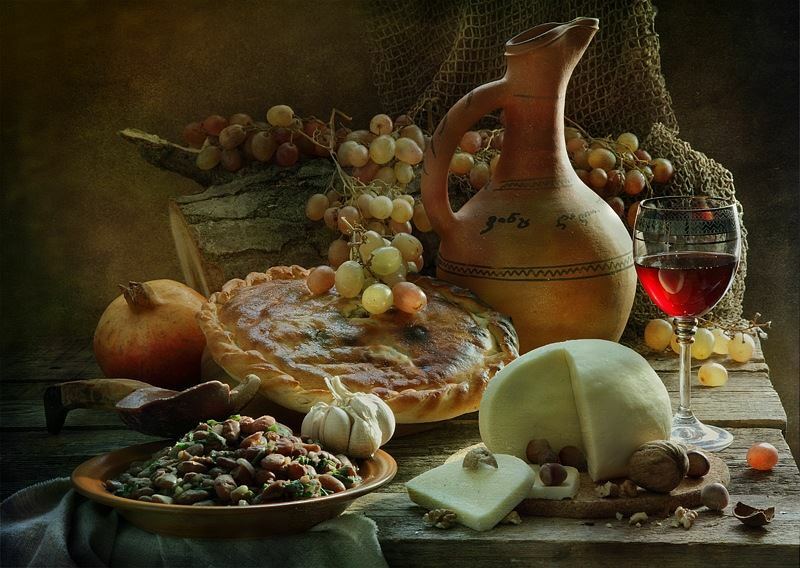 Georgian food and wine are best observed at a Georgian feast, or supra (a traditional banquet feast). In fact, it is hard to find the words to describe the experience. Part of the Georgian tradition is to have a toastmaster at such gatherings. Usually a toast is accompanied by a song or verse. While in Georgia we experienced a number of Georgian feasts that involved food and wine. Georgian hospitality was super hot on a cold mid-November day when we arrived at Shumi Wine Company, Tsinandali in the Telavi region of Georgia. My primary goal for going to the Republic of Georgia was to better understanding what is involved in qvevri wine making. However, what I discovered first hand in Georgia was not only qvevri wine making but also a rich tradition centered on wine and food. Georgians truly know how to celebrate with wine and food. During a recent #EWBC post-conference trip to Georgia sponsored by the Georgian Wine Association, Spaswinefood experienced Georgian hospitality at its best. 24.01.2013. Whether the construction of the largest airport in the South Caucasus will be continued, is still unknown. Chief legal adviser to "Rakia Georgia" says that the construction is still suspended. According to Zurab Neparidze, so far "Rakia" has maintained the Poti airport project. However, whether it will be resumed or on whom this fact depends, is unknown. Poti's majoritarian MP Eka Beselia made a statement regarding the construction of Poti airport in radio Commersant air ​​before the elections. President Mikheil Saakashvili voiced the initiative on Poti international airport construction, which was supposed to be the largest in Transcaucasia in 2009, and said that construction had to be finished in 2012. However, environmental protection NGOs protest against the construction of the airport near Kolkheti National Park and think that this construction will cause environmental problems. 22.01.2013 (HTN - Hvino Tour News) Batumi's "Argo" Multifunctional Complex will be opened in April, according to director Giorgi Kavzharadze. Argo's director says that as the complex is being built at the Batumi hill it will be connected to the city via an Austrian made rope-way often referred to as "Batumi funicular". At first stage 8 gondolas will be installed. The setup is meant for 21 gondolas. Kavzharadze notes the complex will have 5 floors, and first two floors will be technical, while cafes and exhibition halls will be located on the remaining floors. He says that the investment required for the project exceeded 40 million and were allocated by a British company. Argo Multifunctional Entertainment Complex was designed by British architect in the ship shape. 21.01.2013. From the fertile wine region of Kakheti—full of beautiful churches, monasteries and wineries—to the ancient villages of mountainous Svaneti, Georgia is a land of unparalleled natural beauty, with a long, fascinating and largely under-appreciated history. 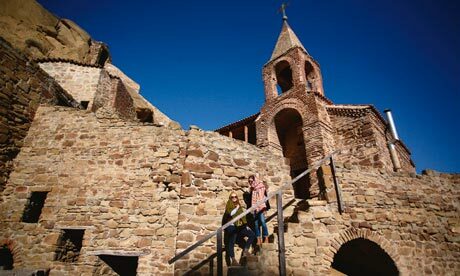 A small and obscure nation located at the eastern end of the Black Sea, wedged between Russia and Turkey, Georgia has been given little attention by Western travelers, and many treasures await those willing to make the journey. Georgia is the oldest wine-producing nation in the world, with 521 original varieties of grape and production dating back to 7000-5000 BC. Georgia’s many languages are unrelated to the Indo-European or Semitic languages of the surrounding region. Georgia is home to some of the most ancient churches in Christendom (it was the second nation to adopt Christianity, after Armenia). 20.01.2013 (HTN - Hvino Tour News) According to Iase Zautashvili, director of Airzena Georgian Airways, the company is working to return the status of Georgia's national airline. Mr. Zautashvili says that communication has already begun with the Department of Aviation and Ministry of Economy and Sustainable Development. As Iase Zautashvili noted, a few years ago Airzena has about 60% market share, however, today it controls only 8-9%. Airzena Georgian Airways is a privately owned airline operating services from Georgia to destinations mainly in Europe and Western Asia. 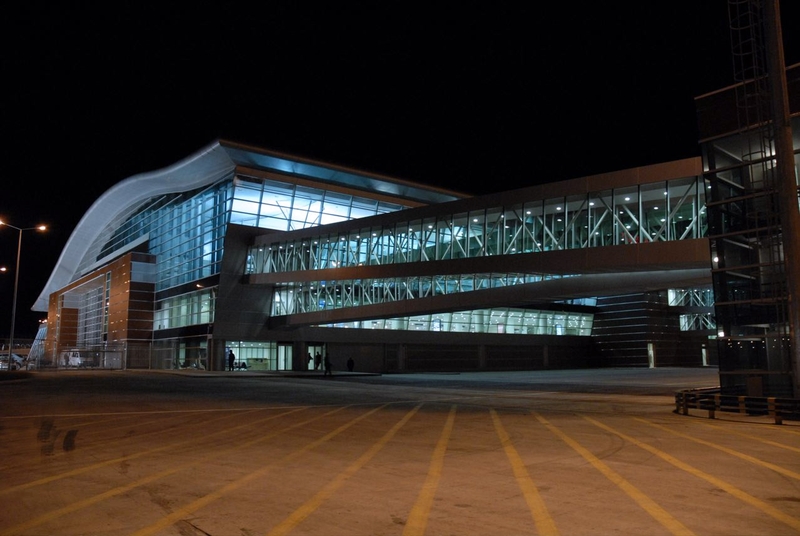 Its main base is Tbilisi International Airport. The airline was established and started operations in September of 1994. Airzena merged with Air Georgia in November of 1999 to form Airzena Georgian Airlines. 18.01.2013 (HTN - Hvino Tour News). The Abkhazia-Georgia-Armenia railway may be re-opened, and much more is possible because Armenia and Georgia have no problems in their relations, Georgian Prime Minister Bidzina Ivanishvili stated at a news conference in Yerevan. Georgia has no problems with Armenia, it still has problems with Russia, he added. “We had – and still have - very serious problems with Russia. But we hope and we are doing our best to restore our relations with Russia as soon as possible. However, the controversial issues of territorial integrity will not allow us to resolve them soon,” Mr Ivanishvili said. The re-opening of the railway should be viewed in this context, he added. Heritage Foundation and Wall Street Journal's Index of Economic Freedom: "Georgia showed the most improvement in 2013"
15.01.2013 (HTN - Hvino Tour News). A joint study 2013 Index of Economic Freedom, published yesterday by the Washington think-tank The Heritage Foundation and The Wall Street Journal, places Georgia at high position. "There are five European countries whose economic freedom status has changed notably in the 2013 Index. Georgia, Norway, and the Czech Republic have become “mostly free” economies. Georgia achieved the largest score improvement in the 2013 Index", - outlines the research paper. "Georgia’s economic freedom score is 72.2, making its economy the 21st freest in the 2013 Index. Its overall score is 2.8 points higher than last year, with improvements in six of the 10 economic freedoms including management of public finance, investment freedom, and property rights. Georgia is ranked 11th out of 43 countries in the Europe region, and its score is the most improved in the 2013 Index. 13.01.2013. In August 2008, I was sitting on a curb in the Georgian village of Akhalgori with journalist Wendell Steavenson watching Ossetian troops loot stores and homes. "This whole thing is crazy," she said. "All Georgia had to do was invite Russia to the dinner table. They would have conquered it with food and wine." She, like many foreigners who have spent any time in the country, is intimately familiar with Georgia's most formidable weapon. It's not the "strategic partnership" that brings all those Washington lawmakers to Georgia. It's the food. 12.01.2013 (HTN - Hvino Tour News) Chairperson of the Civil Aviation Union Giorgi Kodua says the 90% of aviation sector is monopolized, which causes expensive cost on flights. Giorgi Kodua has defined at the briefing today that the additional tax collections imposed for national air transporter companies has resulted in the rise of prices on flights. Kodua calls on the government to revise the aviation strategy, otherwise, he fairs the current system will affect development of tourism in the country. `Business sector, which had to pay millions to the state budget as additional tax collection, has included this part of the tariff in ticket costs. Development of air-sector depends on chief tariffs and direct flights, but during past few years the only development we had was night flights, transit flight and high cost of tickets. Therefore, it is natural that the development of tourism sector may be affected,` Kodua said. 11.01.2013 (HTN - Hvino Tour News). The bust of Joseph Stalin has been restored in the village of Akura, Telavi District of the Kakheti Region, in the eastern part of Georgia. The monument was secretly taken down in 2010 and stored by local resident Badri Gogiashvili. Recently local authorities permitted to restore the monument. It is the second monument of Stalin restored in Georgia after the parliamentary elections won by Prime Minister Bidzina Ivanishvili on October 1, 2012. The first monument of Stalin was restored in Zemo Alvani in the Ahmeta District. The monument is to be be erected in Gori through private donations of locals. Read more: "New York Times": Georgia: A Stalinist Restoration. 10.01.2013. The Georgian government has suspended a memorandum with a Turkish operator of the Tbilisi International Airport on reconstruction of now unused runway, which means that the Turkish company will no longer get extension for more than ten years of its right to run the airport till late 2037. In August, 2012 Georgia’s previous government signed memorandum with TAV Airports Holding, which owns 76% shares in Tbilisi airport operator TAV Urban Georgia, under which the airport operator company was planning to invest USD 65 million in reconstruction of the unused runway, one of the two runways at the Tbilisi airport. In exchange TAV received extension of airport’s operational right from February 2027 to November 2037. 07.01.2013. Today Georgia and other Orthodox Christian nations celebrate Christmas, which is official holiday in Georgia. Merry Christmas and Happy New Year! Why did you decide to resign from the agency? Today you will go back to the private sector, why? My decision to come to Georgia was correct as I worked at a very good moment in terms of tourism development in Georgia. This was one of the fastest growing sectors over the years and, of course, for me it was a great honor to be one of the partners in this process. On the other hand, I think that the private sector already offers many opportunities for self-realization in the same profession. I remain in this sector, in the tourism industry. Not necessarily people in this profession need to work only in state structures. 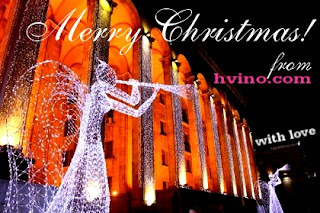 04.01.2013 (HTN - Hvino Tour News) H.E. Gabriela von Habsburg, also known as Archduchess Gabriela of Austria, is Ambassador of Georgia to Germany since 2009. Germany's Globus Vision published an interview with Ambassador Gabriela von Habsburg in January 2013. The reforms implemented in recent years, along with a privileged geographic position and a well-functioning democracy, have made Georgia a highly attractive place for doing business, she said. 03.01.2013. The republic of Georgia has landed in the international media spotlight for a variety of reasons in recent years and months, from its conflict with Russia a handful of years ago to its pro-investment and development environment and advances intransparency and pro-business regulatory pushes. Georgia is also gaining popularity as an off-the-beaten track tourist destination - thanks in large part to its gastronomical prowess, which has been featured in various media outlets, including The Huffington Post citing Georgia as a top tourist and culinary destination for 2013. 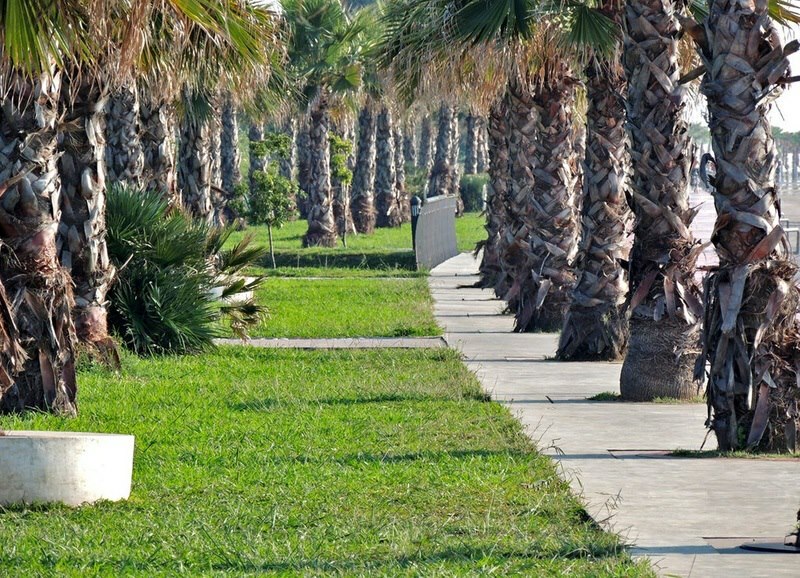 In the midst of this positive attention, the Georgian region of Ajara has also made international news, thanks to Donald Trump visiting the region and expressing interest in developing a casino and hotel in Ajara's capital, Batumi. Trump's interest has created a unique opportunity for Ajara's burgeoning tourist sector. Ajara offers natural beauty, prime Black Sea coastline, a climate for year-round visitors and an historical tourist industry from the Soviet era that has continued to attract tourists from neighbouring countries. 01.01.2013 (HTN - Hvino Tour News). Georgian national airline Airzena' general director Iase Zautashvili said that in 2013 the company plans to add new destinations. "We look in the New Year with hope and believe that the past problems will be resolved in 2013. In addition, we offer better services to passengers. New flights are planned to be added as well, "- Zautashvili said.